Below the City Market is a place that will make the hairs on your neck stand up. Indianapolis’ 20,000sqft subterranean catacombs take “best-kept secret” to a new (underground) level, as they are one of only a dozen catacombs in the US. You don’t have to be of the spirit world to visit -- sign on the dotted line and head down underneath the city to a damp, cold world of barreled ceilings buttressed by dozens of brick archways and an uneven, original dirt floor. The space is stunning, with low lighting that lends to the ghostly lore. At various points, the catacombs were a homeless shelter, a firing range, a storage facility, and a really big room for a boiler system. While it never was a burial ground -- so we’re told -- the chilling catacombs are now open for visitors. Brave souls can take a tour or attend a number of parties, but there’s a lot more history than meets the eye. If the hairs on your neck are creepily yanking you toward the catacombs, there’s no shortage of ways to spend your time beneath the surface. Halloween will surely lure the curious to the catacombs, with eerie programming that includes a secret dinner and a series of special tours. For a peek into this real-life haunted house, spirits are just a click away. You can also experience the ghostly underground in person during a paranormal investigation demo on Oct 26th. Ghostbusting hopefuls can join investigator Craig McCormick and Other Side Paranormal Research as they seek signs of other-worldly activity. There’s also some evidence of spirits in the catacombs available online. There are also other, slightly less spooky, events hosted in the catacombs throughout the year. The Indy Film Festival has hosted movie screenings in the catacombs -- think films like Fight Club, Labyrinth, and Raiders of the Lost Ark -- while new “audio-visual sci-fi experience[s]” developed by IUPUI meld silent film, acoustic instruments, and computer interactivity in a historical setting. If a basement celebration hosted by the hippest cocktail joints in town is more your speed, there’s the annual Repeal Day party to celebrate the end of Prohibition. On Dec 5th, you can celebrate the return of legal libations with fancy drinks served, ironically, like a speakeasy from the era. There’s no visible entrance to the catacombs, but its maze of 140 pillars has been very active over the past 130 years. 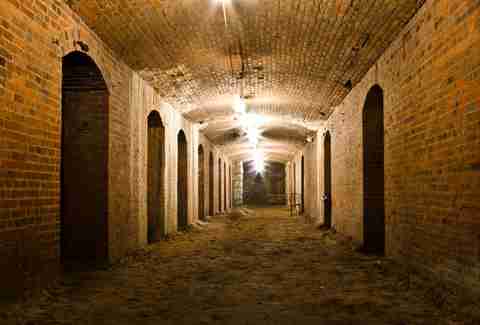 The catacombs were originally built as a foundation for the massive 3,500-person Tomlinson Hall, which stood beside the City Market plot and was basically Indianapolis' first convention center. The building was completed in 1886, and all major gatherings -- from sporting and theater events, to speeches by presidential candidates -- were held in the Hall. While much happened in Tomlinson Hall until it succumbed to fire in 1958, most folks didn’t think much happened in its catacombs. Indianapolis winters can sting you to the core, and the winter between 1912 and 1913 was particularly brutal. “Mayor Shank, who was mayor of Indianapolis at the time, ordered for the catacombs to be opened up and become a temporary homeless shelter to several hundred of Indy's homeless population,” said Stoesz. This frozen refuge went on for a couple weeks. 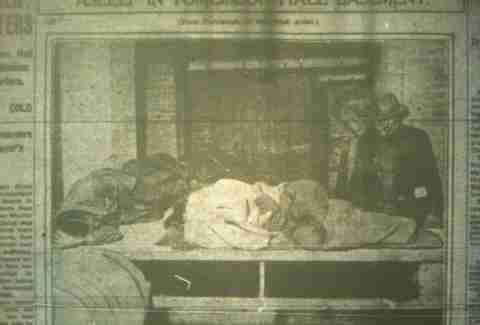 Every morning, the homeless were ushered out so the catacombs could be fumigated for communicable diseases. Every day, Mayor Shank, his brother, and his secretary fed the homeless with products that were donated by some of City Market's merchants. While the initiative and gesture was generous, the significance of this is even more imperative to Indianapolis’ societal history. “If you think about it, in 1912 and 1913, we were living in a very segregated society and this was the first time that blacks and whites were sleeping next to each other. There, in the catacombs,” said Stoesz. 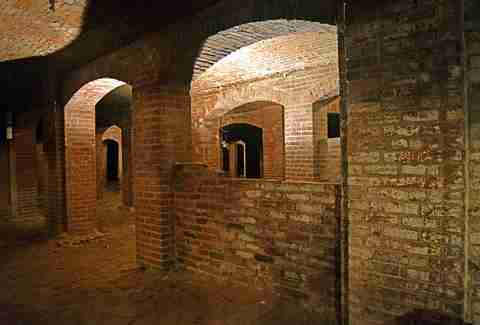 When Tomlinson Hall burned to the ground in 1958, the catacombs sturdily stayed put. After that, the catacombs lay dormant for years. More recently, there have been several events down there -- from elegant dinners to service-industry events -- but all the recent activity is a product of the Super Bowl of 2012. 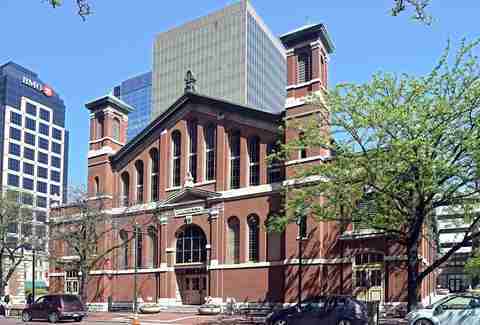 The City Market partnered with Indiana Landmarks to develop a historic and ghost-edged tour. It was an overwhelming success, and now, half-hour tours are given on the first and third Saturdays May through October. “Ironically, it was primarily locals who had never heard of the catacombs or never knew they existed, and were super-intrigued by them,” Stoesz added. 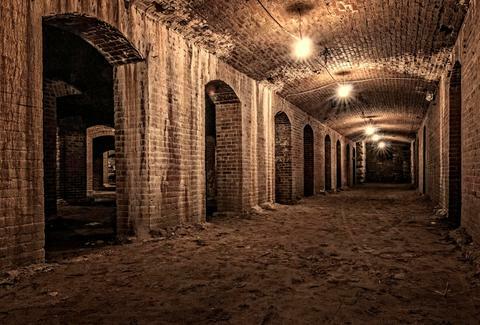 It’s hard not to be impressed by the secrets buried way beneath the bricks in the bowels of Indianapolis, especially if you’ve spent much time wandering through City Market. What lies beneath isn’t for the weak, but it’s one more reason why Indy has even more underrated, understated, and underground cred. Carson Quinn was skeptical, but turned into a believer after spending time in the catacombs. Connect with her about chilling underground experiences via Facebook and Twitter.